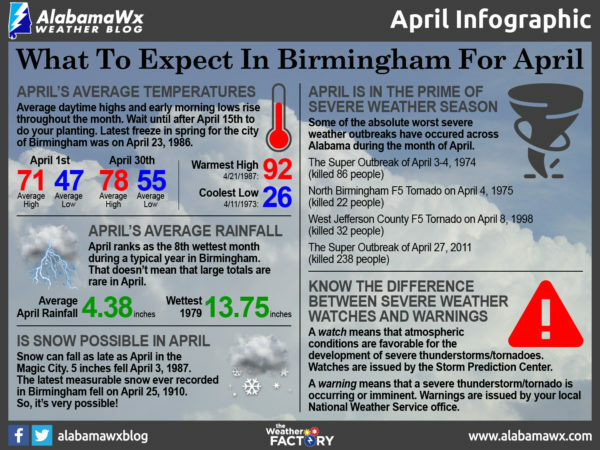 Some of the finest weather throughout the year can be found during the month of April in Central Alabama, but it can also turn ugly with tornadoes, flooding rains, and late season cold snaps. Most of the time, April features spectacularly mild and sunny days, and clear and cool nights. At the start of the month in the city of Birmingham, the average high is 71 degrees with the average low at 47 degrees. By the end of the month, those temperatures have risen to 78 for average highs and 55 for average lows. It can be pretty hot during the month of April in the Magic City, but it can drop below freezing as well. Back on April 21, 1987, the city was in the middle of an unusual heat wave, and the high was 92 degrees, the warmest ever recorded in Birmingham for April. Just the opposite, the coldest ever low temperature of 26 degrees was recorded on April 11, 1973. The temperature generally drops to or below freezing on 1.2 days of the month. The average last freeze for Birmingham is March 30th, but freezing temperatures have been recorded as late as April 23rd (1986). April ranks as the 8th wettest month during a typical year in the city of Birmingham, but that doesn’t mean that large totals are rare for the month. April’s average monthly rainfall is 4.38 inches, but a whopping 13.75 inches fell during the month in 1979. Some of the worst flooding in Central Alabama history occurred in that month. You would think it may be impossible for snow to fall in the Magic City during the month of April, but you would be mistaken. A whopping 5 inches of snow fell in Birmingham on April 3, 1987. The latest in April that the city received measurable snowfall was on April 25th (1910). It rains in April on an average of 9.1 days, with 5 of those days involving thunderstorms. Speaking of thunderstorms, April is in the prime severe weather season for Central Alabama. Some of the worst tornadoes in Alabama’s recorded weather history occurred in April, including the super outbreaks of April 3-4, 1974 and April 27, 2011. There was the April 8, 1998 F5 tornado that struck the western parts of Jefferson County, killing 32, and the April 4, 1977 F5 tornado that ripped across North Birmingham, killing 22. As we move further away from the winter months, the percentage of possible sunshine is on the increase, averaging 63% in the month. That is pretty close to the 66% of average sunshine that we see in May and October. The sky is clear over 28% of the time, on average, and cloudy 32 percent of the time. Dense fog rarely occurs during April, averaging only 0.4 days through the month. April ranks in 2nd place of the windiest month of the year with a mean wind speed of 7.2 MPH, just behind the 7.6 MPH of March.